At the dawn of the 1970s, waves of hopeful idealists abandoned the city and headed for the country, convinced that a better life awaited. They were full of dreams, mostly lacking in practical skills, and soon utterly out of money. But they knew paradise when they saw it. When Loraine, Craig, Pancake, Hershe, and a dozen of their friends came into possession of 116 acres in Vermont, they had big plans: to grow their own food, build their own shelter, and create an enlightened community. They had little idea that at the same moment, all over the country, a million other young people were making the same moveback to the land. We Are As Gods follows the Myrtle Hill commune as its members enjoy a euphoric Free Love summer. Nearby, a fledgling organic farm sets to work with horses, and a couplethe author's parentsattempts to build a geodesic dome. Yet Myrtle Hill's summer ends in panic as they rush to build shelter while they struggle to reconcile their ideals with the somber realities of physical hardship and shifting prioritiesespecially when one member goes dangerously rogue. Kate Daloz has written a meticulously researched testament to the dreams of a generation disillusioned by their parents' lifestyles, scarred by the Vietnam War, and yearning for rural peace. 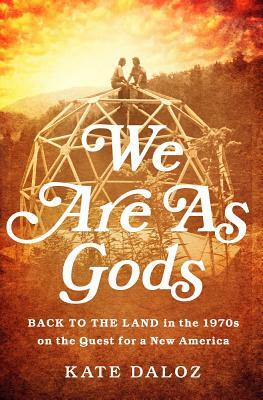 Shaping everything from our eating habits to the Internet, the 1970s Back-to-the-Land movement is one of the most influential yet least understood periods in recent history. We Are As Gods sheds light on one generation's determination to change their own lives and, in the process, to change the world. Kate Daloz received her MFA from Columbia University, where she also taught undergraduate writing and served as assistant director of the Writing Center. She teaches in the writing center at Baruch College and works as a freelance writing consultant. Daloz grew up in Vermont's Northeast Kingdom, in the geodesic dome her parents built after coming home from the Peace Corps. She was also a research assistant for Ron Chernow (Washington: A Life) and Stacy Schiff (Cleopatra: A Life), as well as Brenda Wineapple (White Heat: The Friendship of Emily Dickenson and Thomas Wentworth Higginson) and is a founding member of Neuwrite: Columbia Scientists and Writers. Her work has appeared in The American Scholar among other publications. Kate Daloz lives in Brooklyn with her husband and children.